I met up with Finn last night after my class (~8:45), and went to the Skydome parking garage to sesh for a couple hours. Not having actually ridden my bike 'properly' (abuse the crap out of it) in almost a month now, AND having changed my gear ratio, I felt like a cripple on my bike and I had my mind set on attending our weekly Tuesday trick nights, which I haven't been out to in a while either haha. But BAM. It rained all day. When I got a text from FinnZee during class asking if I wanted to hit up a parking garage, I was excited, I wanted to relearn some of my trickeries. 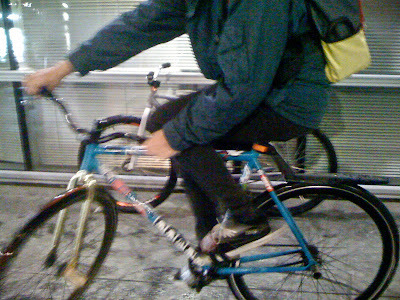 We met up, rode through the rain, and rode down to the very bottom level of the garage where we've had Tuesday sessions in the past winter. Just as we got to that level, we saw a security car with the lights on, so we immediately turned back and made our way back up. And to this moment, I'm not sure if we were being chased or not, but the car started up and was making its way up the levels as we were biking up. We picked up our speed and still heard the car gaining on us at every corner, it was quite intense and my heart was beating faster nonetheless. We waited it out about 15 minutes or so and made our way back down, and we seshed for a good hour and a half maybe? Nothing intense, just a chill hangout sesh. No competition, no drama, no nothing. The ones that are actually enjoyable! I got some of my tricks back, and we worked on tweaking our bikes out on our hops. It was super fun. Finn had also brought 2 apples, and I stole one and we had a great time. I miss having fun sessions like this. School's been way too busy for me and everyone else too I guess. I know I don't have any pictures so it must be boring, but if you've read this far, thanks for reading! I just wanted to point out that I had a good sesh, it's been way too long.